Of late it’s dawned on me, the technology blogs I often visit do make it easy for me to share articles, but they don’t want me to share the articles via email. I scan the full page looking for that email icon and I can’t seem to find it. However, sharing via Facebook and Twitter seems to be always front and center. So, I did my own survey of some of the most visited content sites- technology and non-technology sites to see what kind of sharing options they have. Here are the sites I reviewed which are hyperlinked to recent articles on their site. I selected six of the technology sites I visit the most to read articles- Techcrunch, Pandodaily, Mashable, Linkedin, Business Insider, and Venturebeat along with leading portal and news sites like Yahoo!, CNN and Huffington Post, a top political blog- Politico, a highly visited entertainment site- TMZ, a top sports site- ESPN, and the digital version of leading newspapers- San Francisco Chronicle (SFgate.com) and New York Times. All of these sites enable Social Media sharing, generally to all of these 4 options- Facebook, Twitter, Google+, and Linkedin. In all cases, Facebook and Twitter sharing options were enabled. Linkedin sharing options was not present on Huffington Post, TMZ, ESPN, and Buzzfeed. Google+ sharing was not available on ESPN. The bottom right part of the chart shows sites that do have social media sharing but no email sharing: Techcrunch, Pandodaily, Mashable, Linkedin, and TMZ. 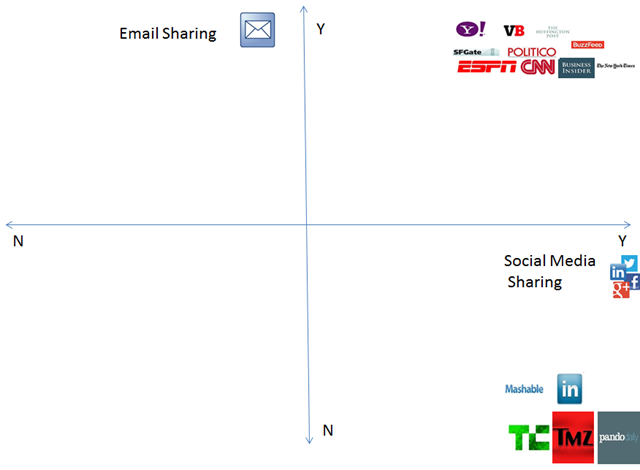 4 of the 5 without email sharing are technology blogs. Thus, four of the six mainstream Tech blog sites I visit don’t allow Email sharing from the article itself (Business Insider and Venturebeat do) while all of the mainstream entertainment, sports, news sites I looked at do, with the exception of 1 (TMZ). So, the natural question for me is Why? Of course, tech blog readers use email also. They have friends and colleagues that they believe would best be served to read the article via email instead of Facebook. Having to copy and past the url link to their email client is always available, but a burden and hassle that most won’t do. So, what gives? I’d venture that most readers if they do choose to share an article, they will only pick one of the options available—they aren’t typically going to choose email, then go back and select Facebook, and then select Twitter. So, if there is one share choice available, the content provider would prefer it to be social media. The one to many benefit of sharing through Facebook and Twitter is what the technology blogs are hoping for. If the average Facebook user has more than 200 friends as this article suggests, then sharing the article through Facebook has the potential for much more impact. Plus, you have the virality impact of retweeting and liking showing up in additional viewers timeline on Twitter and Facebook that can expose the article to that many more users given the network effect of these mediums. Plus, the large technology blogs would suspect given their social media savvy readership, the individuals that a reader would often think about sharing an article with via email would also be a Facebook friend, so why give them the email option, just given them the social media options which covers that one individual plus so many more. Of course, there is a downside to this. The average lifespan of a tweet or Facebook share is diminishing quickly. In this article, it suggests the average lifespan of a tweet is 18 minutes, and I’ve recently seen anecdotal comments of an average of 7 minutes of a tweet. Via email, users may never delete an email, flag it to be read later, and have more attention to their emails than the tweets and facebook posts that are littered with much more frivolous content. Email certainly has its share of clutter but we’re more wired to respond and at least recognize emails more carefully than click on Facebook links. Additionally, there is still often a separation of Facebook and Twitter friends at the professional level that does exist for even tech and social media savvy users. I often have articles I believe my staff at work should read, and I’m not connected to them on Facebook or Twitter and don’t plan to be. There is a separation there that inherently exists with certain types of colleagues. Sharing via email is the best way in these instances to share content and what I’m forced to do is copy and paste the url or text of the article into an email and then email from my email client. A hassle for sure which discourages me to share except for the very most important articles. Overall, I get that the value of sharing via social media is higher to the tech blogs than sharing via email, but as a high volume consumer of digital content, I’d still like to see the Email share button on all of the content blogs. There’s still way too many use cases that email sharing is the best and preferred method of sharing. Email hasn’t gone away and will continue to be highly visible and private communication channel in my opinion in the near-term that all content users will want to have available to them in the sharing economy. I agree! Meaningful dialog with the people you trust can be done more effctviely by email as oppsoed to social media.